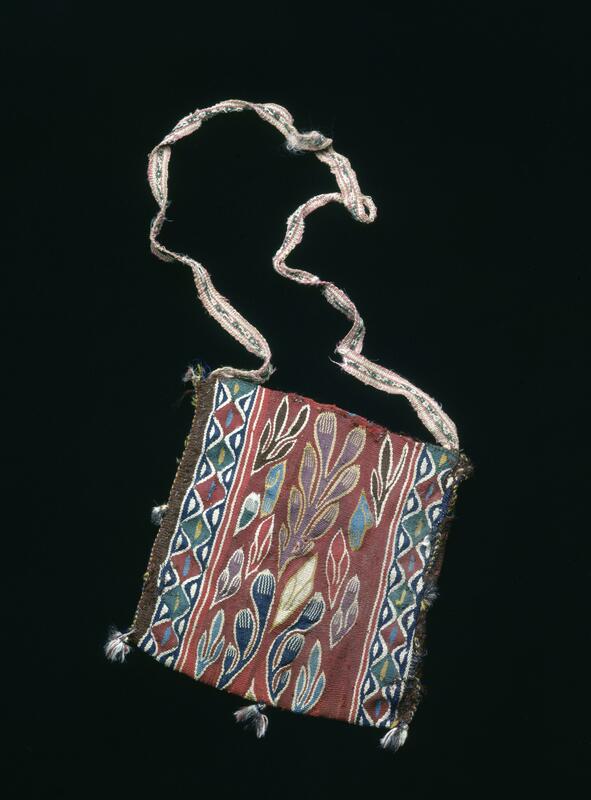 This woven shoulder bag from the Andes probably carried coca leaves, a natural stimulant. The rich cherry-red camelid fiber of this bag was likely created with cochineal, a precious dye made from the crushed bodies of insects. The repetition of colors, including red, pink, purple, white and deep blue, was one way the weaver unified the design of the bag. The division into three vertical panels and the juxtaposition of geometric and plant-like forms create a balanced yet vibrant design. At the top and bottom ends, tiny bands of blue and yellow thread bind of the fabric to create the enclosed bag. At the top, the woven strap would wear out with use, and this one is likely a replacement. While stimulants—yerba mate, chocolate, tobacco—were part and parcel of the everyday life of Spanish America, coca use was most prevalent among native Andeans of all classes, from the most miserable miners to the comfortable curacas. 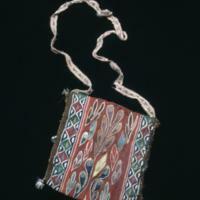 Thus, it seems likely that this small bag (just 7.5 by 6.5 inches) was produced and used in an Andean community, probably one in Bolivia. If so, the bag is one of the few surviving colonial textiles made for indigenous use. This small bag was woven out of camelid fibers, its maker possessing a keen aesthetic sense. In textiles made in the Andes, cotton yarn—stronger than llama wool—would often be used for the warp theads, and camelid yarn—which could be dyed brilliant colors-- would be used for the weft. The bag is currently in the San Antonio Museum of Art. Little is know about its past. While it is impossible to say who slung this bag across his or her shoulder, the attention to pattern, color, and form shows that the bag was designed as an object of aesthetic worth, and perhaps was one of personal value as well. The occasions upon which this bag would have been brought into public view are no longer known. In the colonial Andes, however, indigenous people chewed leaves of the coca plant to give them energy and quit the pangs of hunger. And so this bag could have been used everyday. Yet the weaving’s excellent condition hints at an owner who carefully cared for this bag, perhaps wearing it only on special occasions. Reproduced courtesy of the San Antonio Museum of Art; Purchased with funds provided by the Restricted Textile Fund and by Mr. and Mrs. Marshall Steves in memory of Virginia Carrington; 86.43. Allen, Catherine. 1988. The Hold Life Has: Coca and Cultural Identity in an Andean Community. Washington D.C.: Smithsonian University Press. Gisbert, Teresa, Silvia Arze and Martha Cajías. 1987. Arte Textil y Mundo Andino. La Paz: Gisbert y Ca. Rowe, Anne, Laura Miller and Lynn Meisch, eds. 2007. Weaving and Dyeing in Highalnd Ecuador. Austin: University of Texas Press.